What Are The Rules to Keno? - Casino Answers! Casino Answers » Keno » What Are The Rules to Keno? What Are The Rules to Keno? 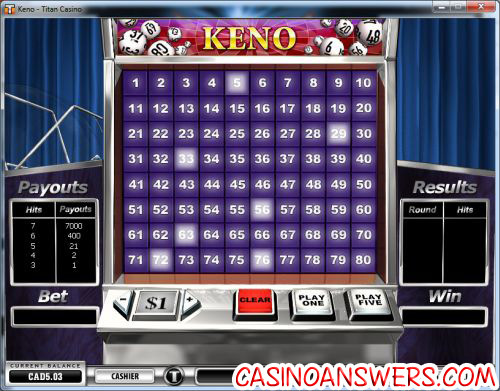 Keno is one of the simplest casino games to play. Everything is practically done for you – the only decision you have is what numbers you think are “lucky” really. Whether you’re playing it online or at a live casino it plays the same. If you’ve played bingo, it’s very much like that. 20 of these numbers are going to be “called” randomly. Your aim is simple: to guess what numbers are going to come up. You don’t have to guess all 20 numbers. You can guess from 1 number all the way up to 10 numbers, and you have different payouts based on how many numbers you have selected. For example, if you choose three numbers and you hit all three numbers the payout will be 16:1. If you chose six numbers and get all six, then the payout for those is 75:1. Also you don’t have to get EVERY number. If you choose six numbers and only get three correct, you still win money at a 2:1 payoff. We should also note that 1 to 10 numbers is the standard, however some casinos will let you choose all the way up to 15 numbers, while other casinos will even let you attempt to guess all 20 numbers. And while 80 numbers is the standard, there are many games that will also offer 40 numbers to pick from as opposed to 80. Although they will have a different payout structure etc. In a casino with 15 numbers available to choose for example, the payoff for all 15 numbers is 10000:1, while you don’t even get 1:1 odds until you get 5 numbers. That’s really the rules to Keno. Pick numbers. Get lucky. Then pick numbers again. While every keno game in an actual live casino will follow these rules, you will find a few differences in games online so just be sure to read up on them beforehand. While the mass majority of them are exactly the same just with different graphics and layout, there are some keno games online that offer additional features such as a “superball” that means you get a payout multiplier if you hit it. Where can I play this “superball” form of Keno? The best thing to do is check out our section entitled different types of keno games. Within there I provide a list of all of the variants of keno that you can find online so you can see what different features there are. Do the rules of multi card keno change? What are the rules of multi card keno compared to single card keno? The rules of multi card keno are exactly the same as the rules of single card keno, other than the fact that you are playing multiple keno cards at once. How do you play Keno? Where can I find Keno rules?